Cost to install a swimming pool heater varies greatly by region (and even by zip code). Get free estimates from swimming pool builders in your city. Cost to install a swimming pool heater varies greatly by region (and even by zip code). Get free estimates from swimming pool builders in your city. How much does it cost to install a swimming pool heater? Even if you live in a warm place, you’ll likely want a swimming pool heater so you can enjoy your pool in all sorts of weather. There are a variety of swimming pool heaters available, and each kind works differently depending on the size of pool and the climate. When choosing what type of pool heater to purchase, you should consider the amount of energy it will take to run, the type of pool where the heater will be used, and its location, these factors are addressed in the table below. For this example, we’ll look at the cost of a heater for a standard 32’x16’ in-ground pool, which averages $1,800-$2,400. Electric resistance heaters work when electric currents travel through the resistor to heat the water. These heaters don’t release air pollution, but they do use a lot of electricity, which can lead to high energy bills, especially when used to heat a large pool. 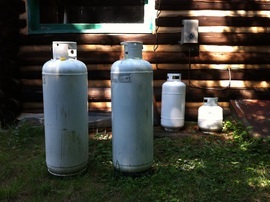 Gas heaters use either propane 2 or natural gas in a combustion chamber, which is transferred to the water when the water moves through a filter. These heaters heat the water fairly quickly and can heat to a set temperature in any climate or conditions. A heat pump 1 transfers heat from water (geothermal pump) or air (air pump) via electricity. The process is inexpensive and fairly eco-friendly, but it takes a while for the system to get working, which means it can take some time before the water is heated. Solar heaters work when solar panels collect heat that is transferred to the water. They are fairly inexpensive to operate because the sun does all the work, but they also rely on consistent sunny days, which makes them a good fit for pools in sunny climates. Most heater types work well in in-ground pools and above-ground pools, but solar panels are the most common for above-ground pools and gas heaters are the most common for in-ground pools. Electric, heat pump 1, and gas are all good options for indoor pools, but solar is not. Pool heaters are measured in BTU units. The required power of a heater is determined by the size of the pool, as shown below. Our example of a standard 32’x16’ in-ground pool would require a 300-400 BTU heater because of its 512 square feet of pool surface area. Pool manufacturers provide the efficiency of the heater, which is the percentage of energy used that actually makes it to the water. Efficiency is shown as a percentage of the BTUs that are used to heat the water. Based on rules from the U.S. Department of Energy, all pool heaters must have an efficiency rating of 78% or higher. The efficiency rating should be clearly displayed on the pool heater box. In general, heaters with a higher efficiency rating cost more, but they also lead to lower operating costs over time and less wasted energy. Although it may be possible to install a pool heater on your own, it is recommended to hire a professional, especially for a gas or electric heater. Many pool professionals or electricians charge on a per-project basis instead of a per-hour basis. The average cost to install a pool heater is $400-$500 for labor. If additional supplies, such as wiring or plumbing, is required, these minimal costs are typically included in the labor total. Automatic pool covers roll and unroll with the push of a button in as little as 30 seconds, but can be two to three times the base price. Semi-automatic covers roll and unroll with a motorized system, but the cover must be guided by a person. Manual pool covers use a hand crank to roll and unroll; they are the cheapest options. Safety pool covers are made of mesh or vinyl 4 and attach to the outside of the pool with think straps. These covers are pulled tight to prevent debris, animals, or children from entering the pool. They are more expensive and can cost 50-70% more than a winter cover. 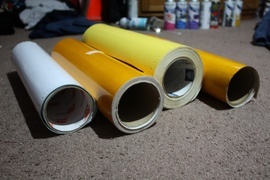 Winter covers are made of thinner polypropylene or vinyl 4 and are the more popular option. They keep debris out of the pool but aren’t as secure or heavy-duty as safety covers. Most swimming pools are kept at 78-82 degrees. For each degree in temperature, the energy costs increase by 10%-30%, depending on your location and climate. If the pool won’t be used for a few days, it saves more energy to turn the heater down or off instead of leaving it at the desired temperature permanently. If you live in a hot climate, you can typically avoid heating your pool in the hottest season by using a pool cover. However, that depends on your personal preference for the water temperature. If you live in a mild climate, it is recommended to heat the pool at night to keep the water at a comfortable temperature. Removing an old heater and disposing of it can add an additional $200-$400 to your total costs. How much does it cost to install a swimming pool heater in my city? Cost to install a swimming pool heater varies greatly by region (and even by zip code). To get free estimates from local contractors, please indicate yours. Cost Considerations: Heat pumps are best for moderate climates. Another heat source may be needed in areas that get very cold. Geothermal pumps cost about $3,000, and air-to-air cost about $1,000. 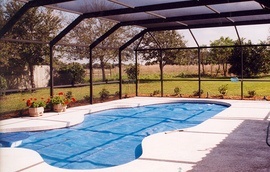 Protective outdoor pool cover used to trap the sun\'s heat, thereby helping to keep pool water warm. Cost Considerations: A solar blanket averages $150 to $225. Automatic types may be 2 to 3 times more. Manual versions are the least expensive option.